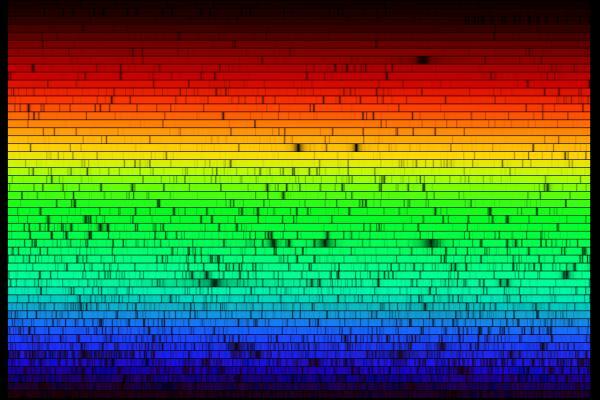 The National Optical Astronomy Observatory has assembled a high resolution image showing the spectrum of our Sun from 296 to 1300nm. Its interesting to note that visual systems on planet Earth have evolved to detect wavelengths of light given off by our sun and those wavelengths are solar specific. Other stars radiate different wavelengths, but I’d suspect that given the place in the electromagnetic spectrum, rhodopsin or rhodopsin like molecules respond to, organisms evolving on other theoretical planets would likely respond to similar spectra. Notably, while the sun appears to emit light in every color, the most prominent emission appears in yellow-green. This is reflected in the sensitivity of photoreceptors with rhodopsin in the blue green spectrum with a peak around 500nm. 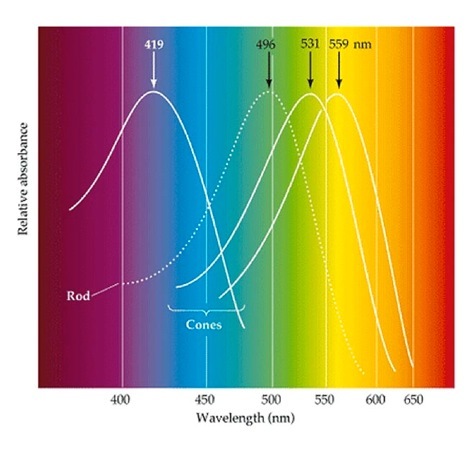 Cone opsins also are tuned to this portion of the spectrum with the “blue” cones responding around 420nm and M-cones around 530nm with L-cones around 560nm.